There is no way of knowing if the Norman church of St. Giles possessed a chancel, but at some time circa l200 one was constructed to the East of the nave. It was in the Early English style of architecture, which was the first of the gothic styles prevalent during the l3th century, being typified by tall thin windows known as lancets. This first chancel was to survive almost intact until its restoration in 1886. 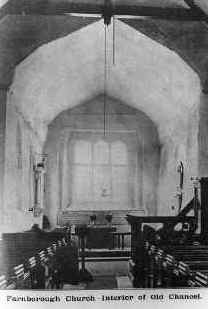 The new chancel, being almost identical in size and shape to the original, was probably built in line with the original foundations. The Chancel today Before restoration, the chancel was constructed of rough knapped flint work similar to that on the nave, with North and South external corner buttresses as well as intermediate buttresses between the lancet windows. These buttresses seem to have been identical to those surviving on the nave, which would suggest they were rebuilt at some point in the 16th or 17th century. The most interesting interior feature, now lost, was the East Window which before restoration seems to have been quite unusual. The surviving window was a large rectangular opening placed in the East wall, which was then subdivided into three lights each with a round head. This window was probably constructed during the rebuilding of 1641. The old photographs also show the survival of two capitals situated at the upper external corners of the window. On closer inspection these can be seen to be mutilated foliage capitals possibly of the 13th century. If this were the case, they would be from the 13th century window. The relative position of these capitals today would suggest that they have not moved significantly, therefore possibly further suggesting that not all the chancel's walls were rebuilt in the 1886 restoration. 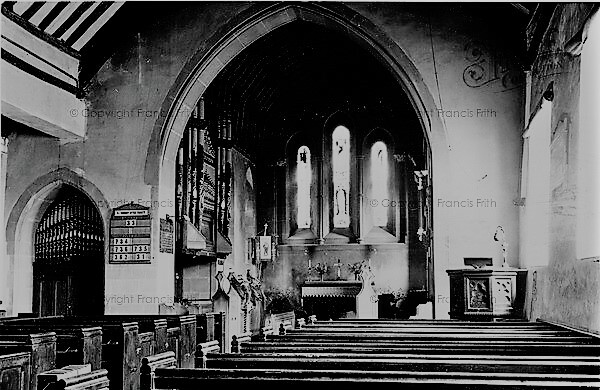 In 1885, Mr Fox, a member of a local brewing family, offered the church a new organ with the proviso that the congregation provide a suitable chamber to house it. The offer was taken up promptly, and by 1886 the Joseph Clarke, the Diocesan Architect, had been appointed to undertake the work. 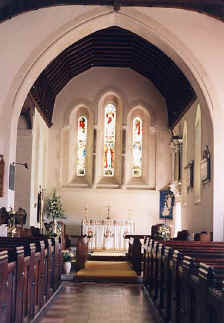 By the time work commenced, the brief had been extended to include the restoration of the chancel, a project which produced the Eastern arrangement that exists today. The original " arched " entrance from the nave into the North aisle was removed and replaced with a cast iron beam. In addition, the chancel was almost totally dismantled, including the removal of wall buttresses. The Chancel circa 1880, before the 1885 changes The Chancel circa 1955, before the organ pipes were moved to the gallery, which took place over 50 years ago. The most dramatic change, apart from the addition of the organ chamber, was the re-forming of the East window. The architect Joseph Clarke clearly felt that as the chancel was Early English in style it should have an East window to suit. The new window consists of three lancet lights, with the central one being taller than the two flanking, these being divided by two columns formed from sections of Purbeck Marble divided by moulded courses of Bath Limestone. To complete the rebuilding of the chancel, a new floor was constructed of plain and decorative acoustic tiles and during this work it was said a bottle was found containing documents relating to the church’s restoration after the storm in 1639. The chancel fittings are all modern, dating from the first half of the 20th Century. The original Victorian stalls were removed around 1935, and used in the new parish church of St. Mary's, Green Street Green . The Rector's Stall was provided as a memorial to Major General Sir Richard Ewart, who died in 1928, and of his son, Lieutenant Richard Ewart, aged 26, killed in France 1918. The choir stalls and altar rail were given in 1935, as a memorial to Marion Manning.